If you are a fan of makeup, runway fashion, special effects makeup, or the TV show, Face Off, you know know what amazing things can be done with makeup. But I don't believe the average person views makeup as an art medium. I recently ran across this news article describing one cosmetic company's attempt to break a world record for the largest art piece to be entirely painted with makeup. You can view the makeup mural and read the article by clicking here. I was really impressed at the attempt to create such a unique piece of makeup art and the number of artists that had never even worked with makeup before. I read the article above around the same time I decided to enter an art competition for a professional organization I am a member of. There were no rules to the art contest, but a majority of the art had to be made with pasta - the main theme of the event. Because I am trying to market my makeup artist services, I decided whatever I created should be "painted" entirely with makeup. My original concept did change throughout the process. However, I am thrilled with the results and I would like to share my art piece with you. 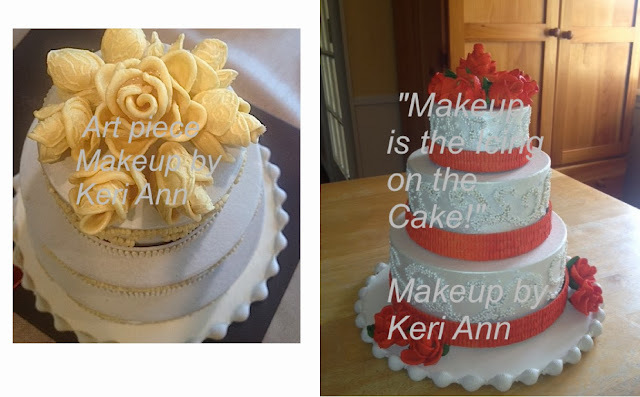 I decided to name my piece, "makeup is the icing on the cake!" The flowers, cake decoration and the scallops on the cake plate were all made out of pasta. The types of pasta I used were: Acini di pepe, Orechiette, Orzo & Pasta Shells. I used Ben Nye Makeup to "paint" the entire pasta cake and the "icing" was created by using Makeup Forever products. I would love to hear about art you have created with makeup and/or pasta!